When I talk to parents about Shortcake, almost all of them tell me the same thing. They want two kinds of albums - baby books for each of their children, and family yearbooks capturing all their love and adventures for each year. But they never have the time to get around to making them. So many people want printed albums for their family but just do not have the 10-20 hours it takes to design an average photo book online. That's why over 80% of photo book projects online are ultimately abandoned. As someone who loves looking through albums and sharing memories with my family, it makes me truly sad to think of all those meaningful memories not being preserved and shared. Helping solve this problem is just one of the reasons I love what I do here at Shortcake so much. If you've been feeling guilty about not making time for a big project like this, we can help. 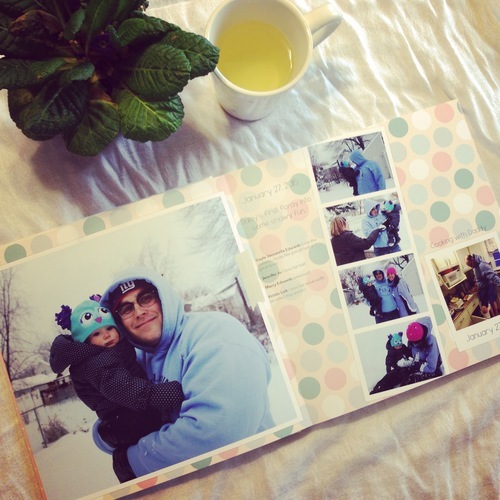 A family yearbook is a perfect project to do with Shortcake. We can quickly gather all your photos and posts from the last year to make a beautiful book for you. Our family's 2015 Yearbook - fresh off the presses. Last week our 2015 Family Yearbook arrived. We've already looked at it probably 15 times. It's Daisy's new favorite book. It's a 70-page album, full of 12 months of fun memories, parties, beach days, holidays, vacations, and more. And you know how much time I spent creating it? Maybe an hour. If that. And that time was spent quickly reviewing the page designs and making a few edit requests to my design team. If a 2015 Family Yearbook is something you'd like (or for 2013, 2014....), I would love to help you experience the same feeling of happiness and pride I have from making one for my family. Start your album now here. And send me a message if you have any questions along the way.